BOSTON -- Boston Red Sox president Larry Lucchino stood in an empty Fenway Park to discuss the ballpark improvements for the upcoming season. BOSTON — Boston Red Sox president Larry Lucchino stood in an empty Fenway Park to discuss the ballpark improvements for the upcoming season. At the home opener Monday, all those seats will be filled. The Red Sox are preparing for the end of the sellout streak that has covered a record 793 regular-season games dating back to May 15, 2003. And, though Monday’s home opener against Baltimore will bring that total to 794, “what happens after that is unclear,” Lucchino told reporters Friday at the annual pre-opener tour of ballpark improvements. “The streak will probably end in April, the first or second series. That’s fine,” Lucchino said. “It’s extraordinary. I don’t think anybody will come close to that for some time. We’re proud of it, but we move on. The Red Sox play the Orioles again Wednesday and Thursday night and, as the announcers say, “Good seats are still available.” Boston could play a record 17 home games in April, when the weather is bad and kids are in school and tickets are most difficult to sell. Although Fenway Park has long been one of baseball’s jewels, it wasn’t until the Yawkey era ended and the ownership group led by John Henry bought the team that baseball’s oldest ballpark truly became a star. 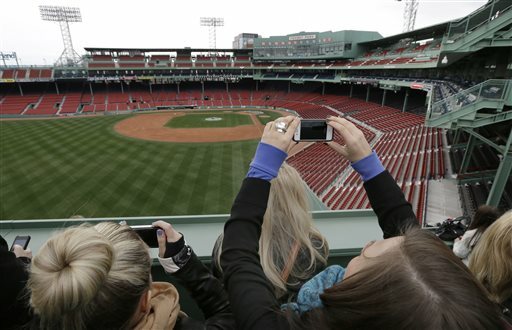 The new owners spent $285 million to renovate Fenway, with new video boards and seats above the Green Monster alongside less visible additions like family bathrooms and a waterproof seating bowl. Tours amble through the ballpark in the offseason and before games, and fans have filled it to watch the Red Sox play in unprecedented numbers. Thanks to World Series championships in 2004 and 2007 — and an expanded capacity — the team has drawn over 3 million fans in each of the past four seasons. “I feel like we’re filled with understanding that a streak of nearly 10 years meets a natural end,” Red Sox spokesman Charles Steinberg said. But the team’s strategy to fill the park has had to change after the ballclub’s collapse in September of 2011 and a last-place finish last season. Major League Baseball also stuck the Red Sox with too many April games. Either way, the Red Sox knew they had some work to do to make it up to fans. The team added new televisions around the grandstands, expanded the information boards along the upper deck and replaced the protective screen behind home plate with a thinner mesh that makes it easier for fans to see through it. The season ticket-holders’ club room now has its own kitchen, new bathrooms and improved acoustics and lighting. New menu items have been added throughout the ballpark, and during April, fans can buy two hot dogs for the price of one or half-price hot chocolate. Players will see an improvement, too, with thicker pads of high-impact foam in right and center field. And ticket prices were frozen for the third time in five years. Red Sox chief operating officer Sam Kennedy said 87 percent of season ticket-holders renewed this offseason, down from 95 percent the year before. Although the team has sold 2.2 million tickets before opening day, the plummeting prices on the resale market may have scared off season ticket-holders who needed to unload games they couldn’t use. The sellout streak of 793 regular-season games — 819, including playoffs — shattered the record of 455 set by the Cleveland Indians when they opened Jacobs Field and also surpassed the all-sports record set by the NBA’s Portland Trail Blazers from 1977-95. The end of the streak will be a good thing for many fans, especially those who had been unable to land tickets in the past. Some games have as many as 5,000 seats still available; Lucchino said groups of up to 200 can still buy tickets to many games. “Throughout the streak, there was an assumption that you couldn’t get tickets,” Steinberg said. “We want to make sure that those who want to go to a game know that they can.